Great for kabobs, pizzas, pancake, cakes, or just normal usage in the fryer, nice addition to the Air Fryer. Stacking the grill rack and metal holder allows more food with better airflow, much easier to cook multiple foods at the same time, makes the air fryer Higher longevity of usage. 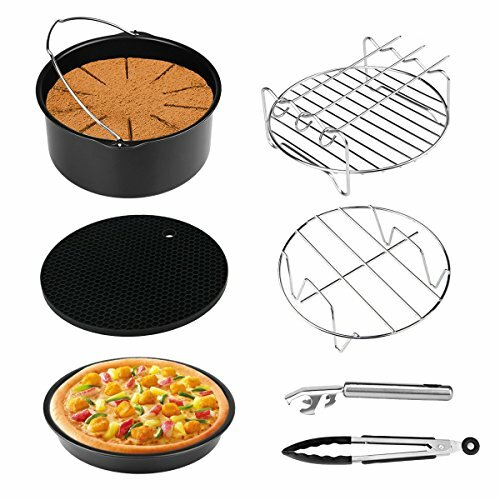 Comes with a cake barrel, pizza pan, heat resistant silicone mat, food tong, pan gripper, skewer rack with 3 skewers, steel metal holder, meeting all your air fryer needs. ★ 7 PACK AIR FRYER ACCESSORIES SET - This Air Fryer Accessory Kit includes 1 Cake Barrel, 1 Pizza Pan, 1 Silicone Mat, 1 Metal Holder, 1 Pan Gripper, 1 Silicone Kitchen Tong, 1 Muti-purpose rack with 3 skewers. Meeting all must needs. ★ PERFECT SIZE - The air fryer accessory kit fits all standard Air Fryers 3.0 qt, 3.7qt to XL Air Fryers 5.8qt, works great with Cozyna, Philips, Gowise, Ivation and other Power Air Fryers, 100% compatible. ★ SUPER VERSATILE - A must-have for anyone who has an air fryer, baking delicious cakes, chicken wings and fries in the cake barrel, making pizza, pancake, sandwiches, fried eggs and whatever biscuits you like in the pizza pan, maximizing your cooking surface with the metal holder, cooking vegetable or meat bbq with the grill rack, using the pan gripper and the food tong to get food out of air fryer without burning yourself. Plus save your kitchen's surface with the silicone mat. ★ HIGH QUALITY: We made sure all air fryer accessories are made of 100% food-grade material for you and your family's safety, FDA approved, BPA free, rustproof and durable. The cake barrel and the pizza pan are made of non-stick Teflon, which makes clean up a breeze. ★ WARRANTY: Purchase with confidence today with lifetime guarantee! Any concerns on the Cozyna air fryer accessories, please contact us at contact seller on the order page, we will issue all your money back to you or send a replacement instantly. If you have any questions about this product by Aiduy, contact us by completing and submitting the form below. If you are looking for a specif part number, please include it with your message.